The Sketch Files: "The Thundercats are loose!" "And we're gonna loosen your bones for ya too." "The Thundercats are loose!" "And we're gonna loosen your bones for ya too." I found myself in a Panthro mood today. I was just going to sketch and mess around but found myself playing on Photoshop until the coloring was complete. So, even though I had originally planned for Captain America to be the first coloured peice Panthro beat him to the punch. I think J.Ho in particular will appreciate this one (yeah, take that Bootleg. Who's drawing 80's toy inspired cartoons now?). Ahem, But I do have to give J.Ho props, his work inspired me to do this in the first place. 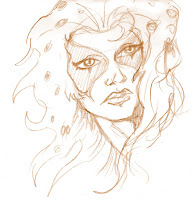 There's also a little bonus in there... while I was sketching I ended up with a decent little Cheetara head... um that's not meant to be dirty. LOL...so what I gotta do to inspire you to finish drawing my tatt???? lol and what happened to you this weekend you didnt come by the house??? Thank you my wonderful sister for your inspirational comments and wonderful criticisms of my work. I'll take all that into consideration. nice! let's see some more colored stuff! where's that cap? WHERE? !